I love Halloween and shiny things so to celebrate the upcoming holiday I’m giving away a Kosta Boda Still Life Votive (the clear glass, as pictured). Whether you are into Halloween, pirates, or human anatomy, this votive is pretty great. There is a long-standing history of high quality glassworks in Sweden. King Gustav Vasa founded the first Swedish glassworks in Stockholm in the 1500s but such large amounts of fuel were needed for the glass production that the industry grew in the region of Småland with it’s large forests. Kosta Boda is the oldest glassworks in Sweden, established in 1742 and this particularly spooky votive made it’s debut in the fall of 2008. Thanks to everyone who entered. The contest has ended and the winner is Curtis Kidd. Congratulations Curtis, and Happy Halloween! Already likes semiswede on facebook. sort of about Sweden, and sort of not. Like · · Share · 2 seconds ago. I love reading Semiswede. Not just because of the lady who writes it, though that is a huge factor, but because I to am part swedish and I know little about my heritage in that area. My family has had a great time following the posts and making several of the recipes posted here. We had an especially tough and fun time making the Princess cake but it turned out great. We would love to see the recipe for Semlor sometime if possible. I would love to win the Kosta Boda skull votive. I have several Kosta Boda snowballs that are absolutely beautiful and the skull is a very festive and fun way to have their stunning work in our home. Also ties in greatly with the Halloween season. The look of it in person, with a candle in it, would be very very cool!! I want to win a cool skull votive! Why? Because candles are cool. And you can never have enough decorations for halloween. And I’m reading the whole Game of Thrones series and the picture of the votive reminds me that I’d rather be reading right now. And now I’m a fan of your FB page, so I get two entries!! Woot! LOL, and now I’m following you on twitter, and it only took me two tries to remember what my dang password was. So that’s THREE entries! I must really want this skull votive, heh. Because I just tweeted it as you asked. I feel led by the nose, at this point. And you must now, that that tweet was the first tweet I’ve done in TWO YEARS. Phew. Made it to the finish line. Just added it as my status on Facebook. You know what, if I win, you can go ahead and send me a Christmas card too, LOL. liked on FB….drooling on keyboard reading applesauce recipe…. I want that skull, I believe it to be one my more fragile ancestors. That and I’m a freak for swedish glass!!! I’d definitely follow you on twitter, but alas I haven’t made an account. Maybe for the skull I’d consider it! I would love to win the scull! I follow the blog and fb. I love the skull. Reminds me of a kid I went to school with. Actually, it is a beauty. I LOVE Halloween. I would be honored to have this skull. Love the SemiSwede pages. I would love to win the crystal skull to celebrate my favorite holiday!!! Love Skulls…. Yep, wife of 19 years and I love Halloween!!! Salem MA is a fav place to celebrate this day! But, not only does the skull represent Halloween to me – But the Swedish connection hits home! Spent 6 mos of my life livin in Stockholm with my dad!! Best of luck to you!! You and your family remain dear to me!!! Our Halloween stuff is somewhere in storage….this would be a cool way to get our celebration started again! I’m already a Facebook fan of Semiswede, too. Would love a creepishly cool skull because our decos are in storage and I love all things Kosta Boda! Very fun to read your blog and get my Swedish fix. I’m already a fan of Semiswede on Facebook. I love crystal votive holders. I like how it scatters the light. Plus, being a skull, it would be great at Halloween. 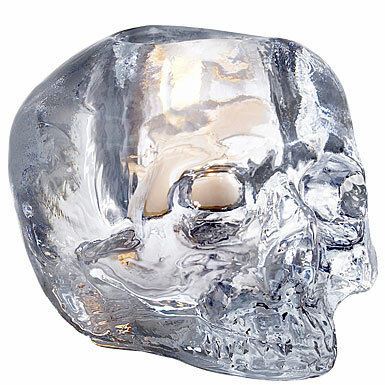 I never knew that a crystal skull could be so Swedish. I would love that skull because my son and I just finished playing Lego Indiana Jones 2 and the Kingdom of the crystal skull. He would LOVE it! I want a crystal skull ’cause they remind me of the set of monkey skull shot glasses I made in Soderquist’s class in high school. And because they are just AWESOME! And of course I’m a fan of Semiswede on Facebook. Emma thought this was really cool, and I always get her a new Halloween decoration every year. Last year, I got her a HUGE rat at Value Village, so this would be perfect for Halloween. I’m already “liking” Semiswede, and I’ve told my friends about it, too! I’d like to add more Kosta to my small collection! I’m now following on FB. And have posted the message on my FB too. Swedes and their flippin’ sweet obsession! WHAT ARE YOU GUYS DOING TO YOUR TEETH? !